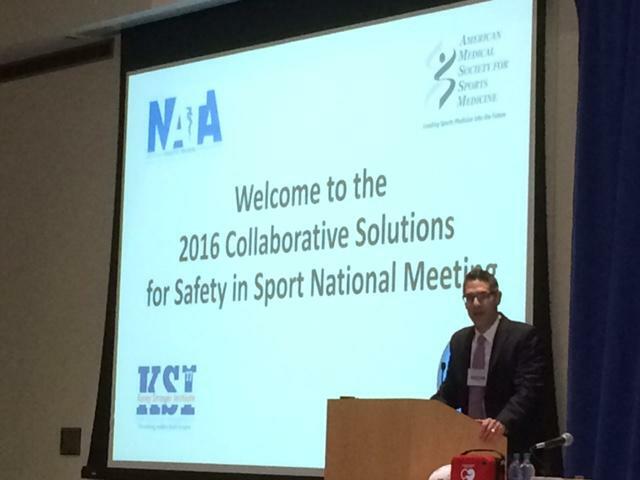 The 2016 Collaborative Solutions for Safety in Sport (CSSS) meeting took place at the NCAA Headquarters in Indianapolis, IN, on March 22-23, 2016. In its second year, co-hosted by AMSSM and the National Athletic Trainers' Association, leaders, decision makers and experts in high school sports from all 50 states and D.C. gathered together to lay the foundation for a new collaborative approach to education, development and implementation of best practices for safety in high school sports. Dr. Jon Divine opens press conference. The event began with a press conference. 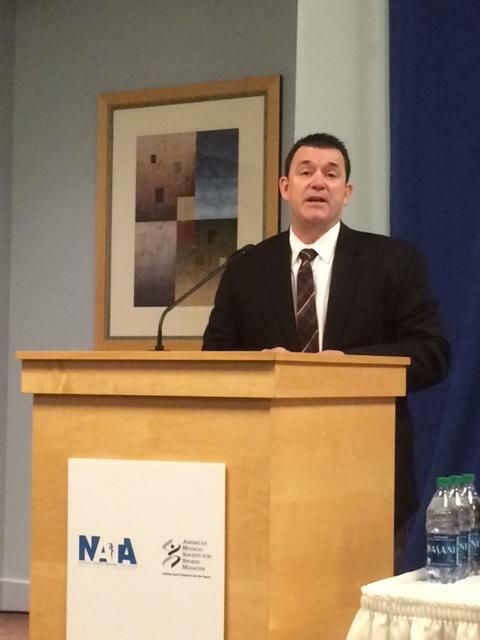 AMSSM President Jon Divine, MD made opening remarks followed by NATA President Scott Sailor, EdD, ATC. 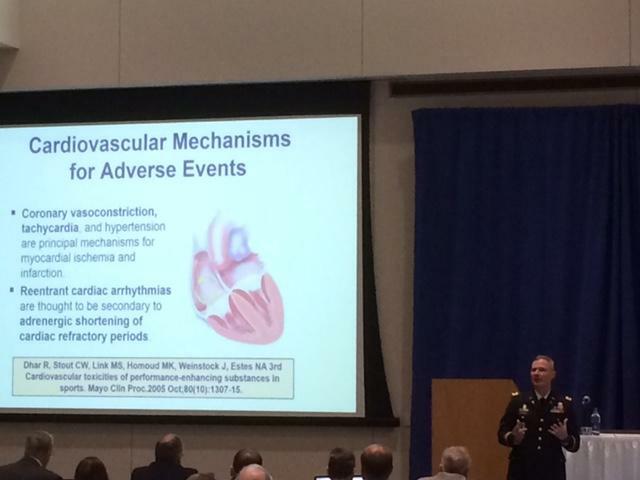 More than 20 AMSSM members were in attendance including presenters AMSSM Past Presidents Drs. 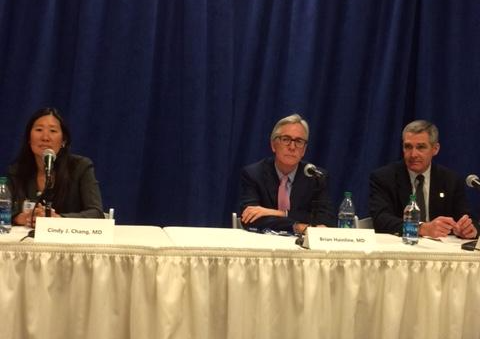 Cindy Chang, Jon Drezner and Fran O'Connor; Second Vice President Katherine Dec, MD; Board of Director Chad Asplund, MD as well as members Drs. Brian Hainline and William Heinz, MD. 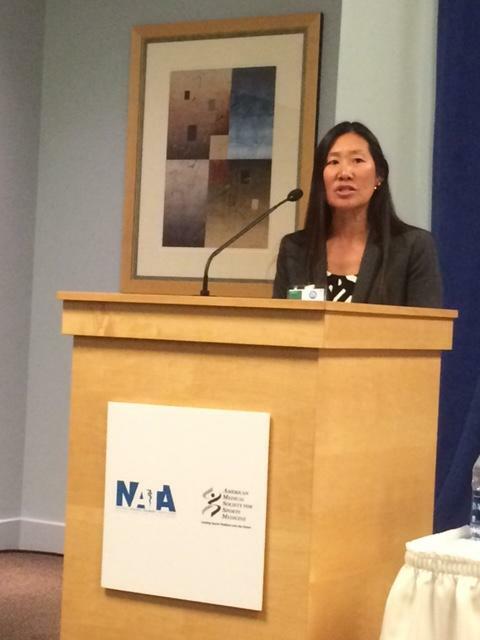 Dr. Cindy Chang discusses the role of the team physician at CSSS press conference. The 2016 event presented talks in the fields of heat illnesses, cardiac conditions, head injuries and mental health. Attendees discussed emerging strategies, research and issues for each topic, as well as shared recent successes throughout the country. This year also included two breakout sessions that provided practical tools and tips to address common challenges. AMSSM would like to thank the National Federation of State High School Associations, Sanford Health, NCAA, Korey Stringer Institute and Gatorade for sponsoring this valuable event. Panel Discussion with Drs. Chang, Hainline and Heinz. Dr. Francis O'Connor presenting on performance-enhancing drugs within mental health. Dr. Jon Drezner served as one of the program chairs for the second CSSS meeting.